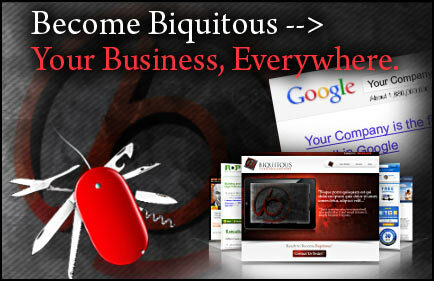 Biquitous is an Internet marketing and consulting services firm that becomes your on-demand CMO. We fill the role of "sounding board", complete with fresh ideas and the subject matter expertise to help your organization gain credibility and authority in your market and take your next leap forward – while effectively handling all the details from start to finish. Without a bold, powerful and cohesive Internet marketing strategy, your business will NEVER maximize the potential the Internet has to offer. The path to online dominance starts here. You might need slight tweaks to your current online presence or a complete website design and development overhaul. Either way, we'll make sure it gets done right the FIRST time! sales -- to your business through SEO, link building, Social Media and other marketing initiatives.